In the four years prior to the road diet, this part of Lawyers averaged 15 crashes per year. 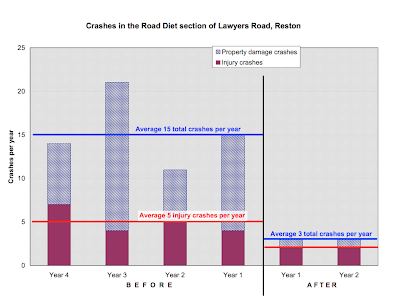 The literature suggested that we might see a crash reduction of 20% to 40%, but in fact, in the first two years after implementation, Lawyers averaged only 3 crashes per year, an 80% drop. Attached is a chart showing the crash history. In addition to the crash reduction, the project also helped slow the worst speed offenders without negatively impacting travel time. Public support was mixed prior to the change, but after one year, 74% of survey respondents felt the change was an improvement to Lawyers Road. I have to turn on to Lawyer's Road to get out of my street. This is a HUGE improvement. And, the kids waiting for the bus before the sun comes out are now standing next to a bike lane, not an active traffic lane. What a PLUS for everyone. Now if they can only fix that part where it goes from the diet to 2 lanes without curb or any margin...down near Staley. Yikes!